Does anyone have any ideas of what to stuff green peppers with besides hamburger & rice??? My guess... Just about anything... Decked out stuffing, Decked out Spaghetti or Goulash. The immagination can go a long ways. I use mild Italian sausage, enhanced with some bread crumbs, egg, milk, fresh ground pepper, Worchestershire, and a little dijon mustard...I don't measure. You can also stuff them with a mess of seasoned seasonal veggies topped with mozzarella cheese for a meatless meal. 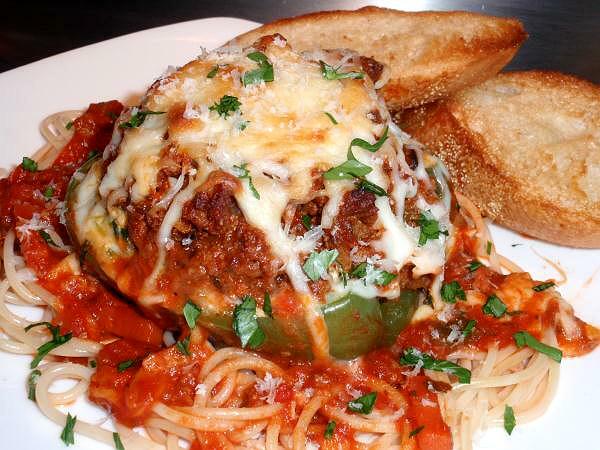 I made some lasagna stuffed peppers that turned out really well a while back. Meanwhile, bring a large saucepan of water to a boil. Add orzo and cook until just tender, 8 to 10 minutes or according to package directions. Drain and rinse with cold water. Heat oil in a large nonstick skillet over medium heat. Add onion and cook, stirring, until soft, about 4 minutes. Add spinach and oregano and cook, stirring, until the spinach is wilted, about 1 minute. Stir in the orzo, chickpeas, 1/2 cup feta, tomatoes, vinegar and salt; cook until heated though, about 1 minute. Divide the filling among the pepper halves and sprinkle each pepper with some of the remaining 1/4 cup feta. Last edited by CaliforniaCook; 10-30-2011 at 07:28 PM. I use hamburger, onion, bread crumbs or oat meal, some of the bell pepper, tomato sauce and top with cheddar cheese. If I make a meat-based stuffed pepper, sometimes I accompany it w/ a mac 'n cheese-type stuffed pepper, & top it off with french fried onions. Thanks so much for both recipes. Love Italian, but definitely can't resist anything that contains Feta cheese!! How about mexican style? Ground meat with Ortega diced green chilis, cumin, oregano, tomato, and topped with cheddar cheese or Monterey Jack. You guys are AWESOME!! Thank you for all the ideas!! You could use any color pepper you like with this dish. I prefer red. This recipe is from the Progresso recipe book. 2. Fill large saucepan half-full with water; bring to boil. Cut peppers lengthwise; and remove seeds. Place peppers in water. Boils 3 minutes; and drain. 3. In large skillet, brown sausage and onion; drain. Stir in soup, rice, ½ cup bread crumbs and 1-tablespoon parmesan cheese. 4. Fill peppers with sausage mixture; place in large shallow baking dish. Cover with foil. 5. Bake 25 minutes or until thoroughly heated. Remove foil. Another great recipe! Thank you!! How about a stuffing mixture that you would stuff a turkey with? I like a sage sausage-bread-celery-onion stuffing, but you could use a cornbread stuffing, or oyster stuffing (yuck) or whatever stuffing/dressing you love on Thanksgiving! thank you! here's a picture of the ingredients I used and a picture of the Bell pepper, cut in half with some oven baked eggplant in the forefront. I had a big bowl of sloppy joes left, added cooked Mahatma instant rice, extra catchup, stuffed into par boiled green peppers, and topped with shredded cheddar cheese. These went into the crock pot, on high, and hope they are done by dinner time. If not I'll finish them off in the microwave. I had three sweet red peppers left over from my salsa making ordeal so yesterday made stuffed peppers using leftover gluten free pasta with our home canned marinara, cooked down cherry tomatoes from our garden, brown rice, and home ground pork breakfast sausage. We topped it with fresh ground manchenko cheese - I added hot sauce at the table. It was all good and got rid of some things stacking up on the counter. Peppers are cheap right now and have been loving the stuffed peppers. Yesterday afternoon I made these using the all recipes recipe and found them to be somewhat bland but after adjusting salt and hot sauce, at the table, were not bad. I was out of shredded mozzarella or would have added that to the mix. It took over three hour to make these! Love stuffed poblano, chili rellenos and stuffed red, yellow and orange bells. Not really a fan of stuffed green bells.